In April of 2011 a new research project for Springer, undertaken by MIDAS in partnership with the Centre for Robotics and Neural Systems (CRNS) began with the aim of building upon the success of the previous Springer programme. The objective of the current research programme is to design and build a new advanced intelligent integrated navigation and autopilot (IINA) system with adaptive capabilities, which will be complemented with a visual SLAM algorithm that will enable continuous operation even in the face of a loss of GPS signal. Autopilot based on a combination of on-line closed loop identification (CLID) and model predictive control (MPC) will be developed, and data fusion for navigation using interval Kalman filters (IKF) will be explored, resulting in an innovative IINA system with superior performance, robustness, and autonomy. Without a doubt whilst under normal operating conditions satellite based global positioning systems (GPSs) are very useful navigational aids for both civilian and military vehicular systems. However, owing to the weakness of the radio signals from the satellites they are susceptible to signal loss when operations are being conducted in confined areas such as rivers, mountains and canyons, and are extremely exposed to being deliberately jammed by terrorists or aggressors during times of extreme tension or conflict. Thus given the vulnerability of GPSs to signal loss, it is prudent not to be totally reliant upon them in the design of navigation subsystems for autonomous vehicles (AVs). One solution to this problem is to enhance the subsystem with an algorithm based on simultaneous localization and mapping (SLAM) techniques. SLAM being the process of simultaneously building a feature based map of the operating environment and utilizing it to estimate the location of an AV. To further improve the capability and performance envelope of an AV it is appropriate to combine a SLAM reinforced navigation subsystem with an adaptive control subsystem thereby transforming them into one fully integrated system. 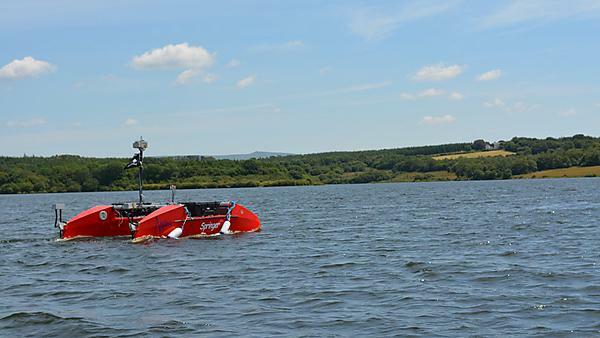 Expanding upon the success of the Springer programme, this research proposal aims to design and build a new advanced intelligent integrated navigation and autopilot (IINA) system with adaptive capabilities for uninhabited surface vehicles (USVs). The existing intelligent navigation (IN) subsystem will be complemented with a SLAM algorithm which will be newly designed and also capable of interfacing with other types of more traditional navigation system. The new improved IN subsystem will be benchmarked against the existing navigation subsystem and a navigation system containing an inertial measurement unit supplied by Atlantic Inertial Systems (AIS) who are the industrial collaborator for this project. [Please note, hereafter this system will be referred to as the AIS navigation system]. During a mission it is envisaged that the SLAM algorithm will be permanently activated even if the vehicle is being deployed in an area which has GPS cover. By adopting such a strategy this will allow the IN subsystem to data fuse the information to provide a more robust and fault tolerant overall system continuously. It will also allow the SLAM algorithm to update and benchmark itself prior to any loss in GPS signals. In addition, a novel adaptive autopilot subsystem will be designed using a less conventional approach than compared to the more established methodologies usually employed in marine control system development. The subsystem will be designed such that it will be readily compatible with the new IN subsystem and other navigation suites. Owing to the possible use of the IINA system in vehicles which may undertake covert missions, it was deemed necessary that the SLAM algorithm should be based on a vision system in order to minimize the risk of detection. In addition, a vision system was also deemed to be a low cost option. Consequently, the outcome of this research project will be an innovative IINA system which will allow USVs to undertake genuinely autonomous missions. Thus with such performance characteristics, it will provide an extremely beneficial tactical advantage to end users when deploying USVs on operational missions particularly those of a covert nature. It should be noted that the existing Springer line of sight guidance subsystem will be employed throughout the research programme. Whilst the intelligent integrated system will be designed and developed for a marine application, the technology evolved will be able to be transferred and used in other types of AV. Indeed, it can be argued that by developing this work in such a difficult and hostile area of application will most definitely confirm the robustness and integrity of the system for potential usage elsewhere.